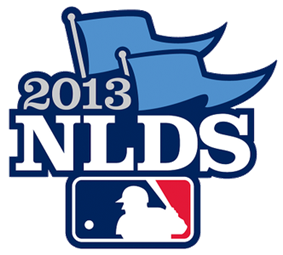 The 2013 National League Division Series were two best-of-five-game series to determine the teams to participate in the 2013 National League Championship Series. The three divisional winners (seeded 1-3 based on record) and a fourth team — the winner of a one-game Wild Card playoff — played in two series. TBS carried most of the games, with some on MLB Network. This was the first postseason meeting between the current National League Central division rivals St. Louis and Pittsburgh. The Pirates made their first postseason appearance since 1992, and their first appearance in the Division Series in franchise history. This was the second postseason meeting between the Dodgers and Braves. The Braves previously defeated the Dodgers 3–0 in the 1996 NLDS. St. Louis won the series, 3–2. The Cardinals set a new NLDS record with seven runs in an inning, highlighted by Carlos Beltran's towering three-run home run (443 feet), his 15th in post-season play tying Babe Ruth for eighth place on the list. Only Derek Jeter (20) and Albert Pujols (18) among active players have more. The Pirates scored first with two outs in the second inning as Gerrit Cole drove in Pedro Álvarez with a single after Jordy Mercer was intentionally walked. Alvarez hit his second home run of the series in the third, a two-run line drive. The Pirates added to their lead with two runs in the fifth inning as Marlon Byrd drove home Justin Morneau with a double and Russell Martin plated Byrd with a single. The Cardinals finally got on the board with a solo home run from Yadier Molina in their half of the fifth inning. It was his third post-season home run. The Pirates added to their lead in the seventh inning as Martin plated Byrd again, this time via a sacrifice fly. The Pirates opened up their first non-Wild Card postseason home game in 21 years by scoring two runs in the first inning. The Cardinals would later tie the game in the fifth with a two-out RBI single by Carlos Beltran. The Pirates responded by scoring the next inning on a Russell Martin sacrifice fly, which was later answered by a Carlos Beltran home run in the eighth. The home run was Beltran's 16th playoff home run, which moved him past Babe Ruth for eighth place in postseason history. The Pirates would take the lead in the bottom of the 8th and win the game by the score of 5-3. Game 4 featured a pitching gem from St. Louis Cardinals rookie Michael Wacha. Wacha held the Pirates to just three base runners (one hit, two walks) through 7.33333333333333 !71⁄3 innings pitched. It was the longest no-hitter length by a rookie pitcher since Jeff Tesreau went 5.33333333333333 !51⁄3 innings with no hits allowed for the 1912 New York Giants. Wacha was acquired in the 2012 draft with the 19th overall pick, from the Los Angeles Angels as compensation for losing Albert Pujols. Pedro Alvarez broke up Wacha's no-hitter in the eighth with his third home run of the series. Matt Holliday provided all the runs the Cardinals needed with his two-run homer in the sixth. Charlie Morton, the opposing starting pitcher, went 5.66666666666666 !52⁄3 innings pitched, allowing just two runs. With the Game 4 win, the Cardinals guaranteed a Game 5, making it the third straight NLDS Game 5 in as many years. Trevor Rosenthal picked up his first career post-season save. Game 5 pivoted Game 1 winner Adam Wainwright against the Pirates' rookie Gerrit Cole. The Cardinals got on the board first in the bottom of the second inning as Jon Jay walked with two-outs and David Freese broke the tie with a two-run home run. The Cardinals added to their lead in the sixth as Jay singled home Matt Holliday to make it 3–0. The Pirates made some two-out noise in the top of the seventh as Justin Morneau, Marlon Byrd and Pedro Alvarez all singled (the last driving home Morneau), but Wainwright was able to get Russell Martin to ground out to end the threat. Entering the bottom of the eighth and with the Cardinals leading 3–1, they put the game out of reach as Matt Adams hit a two-run home run off of Mark Melancon to make it 5–1. They added another run on a Pete Kozma single. Wainwright finished the complete game by striking out Alvarez with two runners on base to send the Cardinals to the National League Championship Series against the Los Angeles Dodgers. Wainwright joins John Smoltz as the only pitchers in postseason history with three or more wins as a starter and at least three saves. Adam Wainwright also became the 5th Cardinal to pitch a CG with one ER in a winner-take-all postseason game. This was umpire Wally Bell's final MLB game as he died 5 days later of a heart attack. Game 1 of the series featured a pitching match-up of Kris Medlen against Clayton Kershaw. Kershaw would go on to strike out 12 Atlanta Braves batters in seven innings, while Medlen was forced out after just four innings pitched. Kershaw's 12 strikeouts was the third most strikeouts by a Dodger pitcher in the playoffs, behind only Sandy Koufax (15 in the 1963 World Series) and Carl Erskine (14 in the 1953 World Series). His six straight strikeouts in the game tied a MLB post-season record set by Tim Belcher in game 2 of the 1988 NLCS. 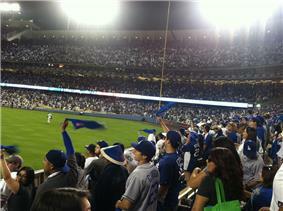 The Dodgers won the game 6–1. In Game 2, Hanley Ramirez homered and doubled twice to account for all three Dodgers runs. However, the Braves scored two runs off Zack Greinke and then two more when Jason Heyward had a two run single in the top of the eighth off the Dodgers reliever Paco Rodriguez. Craig Kimbrel recorded the four out save and the Braves evened the series at one game each. Game 3 featured two rookies starting a playoff game for the first time since 2007. Game 3 was an offensive explosion from both teams in the early innings. The Braves scored two in the first inning, highlighted by an Evan Gattis RBI single and a Brian McCann RBI groundout. The Dodgers answered back in the second inning with a Hyun-jin Ryu sacrifice fly and a Carl Crawford three run home run. The Braves would score two more in the top of the third to tie the game. The Dodgers quickly responded by scoring two of their own in the bottom of the inning and four runs the next inning. Hanley Ramirez would continue his torrid NLDS by hitting two more extra base hits, tying a Dodgers franchise record for extra-base hits in a playoff series set by Steve Garvey and Duke Snider. Additionally, the 13 runs scored was a Dodgers record for a playoff game. At the age of 35 years, Chris Capuano picked up his first career post-season victory. The Dodgers brought Kershaw back on short rest in Game 4 and he pitched six innings, while allowing only two unearned runs (thanks to two Adrian Gonzalez errors). Carl Crawford hit two solo homers in his first two at-bats, the first Dodger to do so in the playoffs since Shawn Green in the 2004 National League Division Series. An RBI single by José Constanza off Ronald Belisario in the seventh gave the Braves the lead but the Dodgers went back up thanks to a two-run homer by Juan Uribe in the eighth off David Carpenter. Kenley Jansen struck out the side in the ninth to preserve the 4–3 series clinching victory for the Dodgers.